What is the benefit, in terms of carbon footprint, of replacing a diesel fueled vehicle with an identical one with a CNG engine? I'm not convinced I can simply take the carbon intensities of these two fuels (kg CO2/kWh) as I'm not entirely sure the relationship from powerplants holds for vehicles. I need the answer to further refine my answer to this question on earthscience. TL;DR: At the tailpipe, a diesel vehicle and a CNG vehicle have roughly equal greenhouse gas emissions. But taking into account leaks in the natural gas production systems, the diesel vehicle is probably the better choice from a climate change perspective. Google Scholar returns a surprising number of results when you search "vehicle carbon emissions CNG vs diesel" (since 2017). Many of the results are locked behind paywalls, but one of the most interesting is not. The tool uses data from Argonne's Greenhouse gases, Regulated Emissions, and Energy use in Transportation (GREET) fuel-cycle model to generate necessary well-to-wheels petroleum use and GHG emission co-efficients for key fuel production pathways and vehicle types. In addition, Environmental Protection Agency's MOtor Vehicle Emission Simulator (MOVES) and certification data are used to estimate tailpipe air pollutant emissions. Various sources are used to provide default cost data, including the Clean Cities Alternative Fuel Price Report and American Recovery and Reinvestment Act awards. 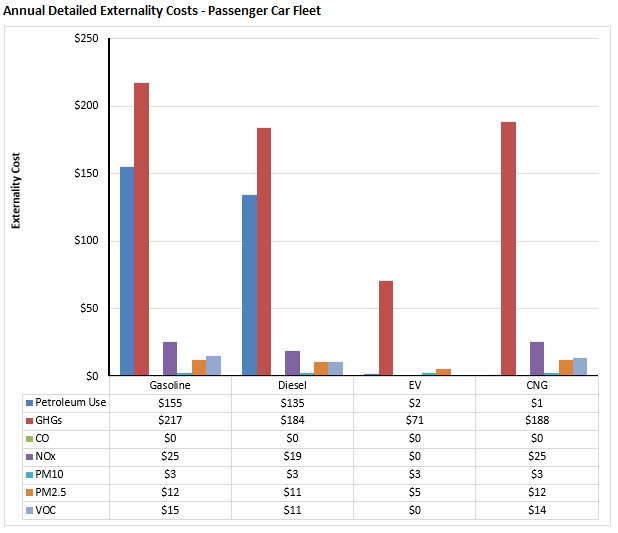 I downloaded the tool and compared light-duty gasoline, diesel, battery electric, and CNG vehicles. UPDATE: Argonne National Lab just released a web-based version of AFLEET where you can do the same comparison yourself. Although it looks like a wash at this point, as @THelper pointed out, one other factor to consider is methane leakage from natural gas production systems, as methane is 25 times more potent as a greenhouse gas than CO2 in the short-term. [R]esearchers found most of the emissions came from leaks, equipment malfunctions and other "abnormal" operating conditions. The climate impact of these leaks in 2015 was roughly the same as the climate impact of carbon dioxide emissions from all all U.S. coal-fired power plants operating in 2015, they found. Not the answer you're looking for? Browse other questions tagged carbon-footprint cars fuel-efficiency or ask your own question.